Product prices and availability are accurate as of 2019-04-21 21:08:29 UTC and are subject to change. Any price and availability information displayed on http://www.amazon.com/ at the time of purchase will apply to the purchase of this product. 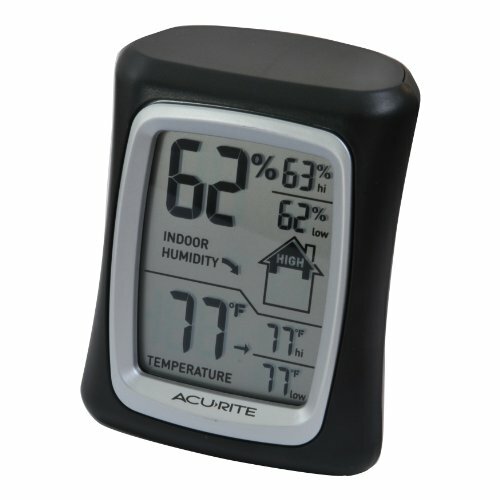 The Acu-Rite Home Comfort Monitor features indoor temperature and humidity sensor. The humidity sensor expresses relative humidity. The home comfort monitor records the indoor temperatures and humidity using its daily high/low memory. The at-a-glance comfort icon shows either low, high or OK humidity level to know at a glance the humidity reading in your home. On the back of the unit, an integrated magnet allows the monitor to be placed on a refrigerator door any other magnetic surface to allow for quick setup. Records temperature in either Celsius or Fahrenheit has a temperature range from 32-Degree Fahrenheit to 122-Degree Fahrenheit (0-Degree Celsius to 50-Degree Celsius) and a Humidity range from 20-95-percent RH. Requires one AA battery (not included).